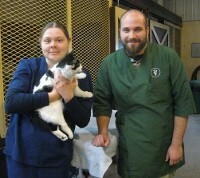 Dr. Christopher Keeley and Dr. Rachael Jones have owned and operated Southlane Veterinary Hospital since December of 1989. Dr. Keeley graduated from Michigan State University's College of Natural Science with a B.S. in Zoology, and from Michigan State University's College of Veterinary Medicine. Dr. Jones graduated from the University of Notre Dame with a B.S. in Biology, and from Purdue University's College of Veterinary Medicine. She is certified by the International Veterinary Acupuncture Society (IVAS), and has also studied at the renown Chi Institute. Trish Escott, Donna Stevens, and KC Young.